Written By: Oliver Wendell Holmes Sr. Imagine a boarding-house in the days when the Civil War was still a decade in the future, in which an erudite, polished, witty, sophisticated, learned gentleman holds forth each day at breakfast, entertaining the boarders with fascinating talk: observations on people and nature, occasional flights of verse, remarks on current events, moralizations and philosophical thoughts, and anything else that comes to his mind. Imagine a boarding-house full of people putting up with such a man, and even liking and respecting him! 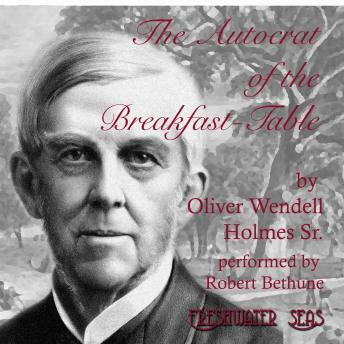 There you have it: the Autocrat of the Breakfast-Table, as imagined by Oliver Wendell Holmes, Sr., father of the famous Supreme Court justice, dean of the Harvard Medical School, lecturer, writer, poet, co-founder of the The Atlantic Magazine, and as charming a conversationalist as one would care to meet--provided, of course, you don't interrupt him! And yet, for all his powers of mind, he is very human as well; there is one of the lady boarders, a certain schoolmistress--keep an eye on her! As if the charm, grace, and variety of this man's mind were not enough, the book also gives us a fascinating picture of life in the United States, specifically in Boston, over 150 years ago. The manners, morals, opinions, thoughts and dreams of Americans of that time are fascinating, both in their similarities and differences to our own, and in the ways in which the unspoken assumptions that underlie so much of who we are have changed and yet remain recognizeable. There are two or three passages in which the unquestioned, indeed almost unexamined, racism of the day does appear. We do well to remember that some of our greatest minds have thought and spoken in that way. For that reason, those expressions remain as Holmes wrote them in 1857. A Freshwater Seas production.